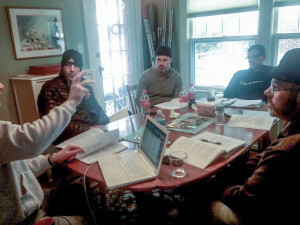 Your Negotiating Committee met at the “Union Hall”, Saturday February 7, to go over proposals for talks with Meredith set for March 23-27. (L-R) Andy Halpin, John Discenza, Al Wurst, Ernie Whitehead, and Kyle Buchanan. Photo taken by Staff Rep. Lou Fallot. ← Welcome to the Re-Launched Nabet17 website.